Here is a good old-fashioned American musical that effectively acts as an homage to the vaudevillian circuit that saw many performers realize their talents including numerous future Hollywood icons. At the core is a musical dream team in Judy Garland and Gene Kelly. Behind the camera is the much revered Busby Berkeley who made musicals into gargantuan extravaganzas thanks to how he managed to capture human forms from above like no one before him. Ironically, here he’s working in a somewhat more conventional and dare I say, informal setting where we get to share the mundane spaces with our stars. Kelly is Harry Palmer, a man who makes a living clowning around on stage. The arm spinning pirouettes and the athletic moves that defined his style of hoofing are obvious from the outset as are his infectious charm and winning smile. He’s still in the latent stages of his genius but that’s okay. There’s still time. Judy Garland at this point in her career already had sizable stardom and it was Kelly the Broadway up-and-comer featured in his film debut. But in the ensuing decade, there was no doubt about it whatsoever. They both became quintessential musical stars of a generation along with a select few. Jo Hayden (Garland) is a song and dance gal who while not having made “The Big Time” yet, still has a noticeable amount of talent. She partners with the good-natured Jimmy Metcalf (George Murphy) who harbors an obvious crush on her. She thinks he’s sweet. Harry Palmer on the other hand, always seems to be making a fool of himself. A genuine person like her can see right through his come-ons. While her gangly brother (Richard Quine) agrees to finish up his med school, Jo is following her ambitions to get somewhere. She subsequently realizes she does have a bit of chemistry with Palmer on stage after an impromptu performance, if not for the fact that she is already a part of an act. Jimmy does the noble thing and lets her go as they all have their sights on the Palace Theater in New York City. You see, it’s the holy grail for vaudeville performers. It means you’ve made it. Palmer is ecstatic when he meets a singer (Martha Eggerth) who already performs there, thinking she might be his in. But he remains true to what he has going with Jo. Still, time and time again they’re playing small towns and their aspirations never seem in reach. Even when it is right there in front of them and their manager (Keenan Wynn) has seemingly pulled through, Harry is torn up to find that he’s been drafted to head over to France to help the doughboys in putting the Kaiser to rest. He’s no draft dodger but he wants his dream so much and they are so close to being realized. He takes a plan of action that Jo misconstrues as cowardice. She’s ashamed that he would do such a thing especially since her brother is overseas fighting already. Thankfully that is not the final word. Life sometimes has a curious way of bringing people back together and in the case of this cinematic world, we get a cheering finale courtesy of the MGM dream factory. While For Me and My Gal revels in its star power and the intimate chemistry built between them on the stage and in dressing rooms or in train compartments, we are soon reminded that this film has an ulterior motive. It’s a musical, it’s a romance, but it’s also a product of the American homefront. Like a Sergeant York (1941) or a Yankee Doodle Dandy (1942) this effort was made with a higher purpose to act as a kindling rallying cry for nationalistic fervor going into WWII. However, just like its contemporaries, the reason we’re still watching it today isn’t necessarily due to those aspirations but the emotional connection elicited from its stars. This is what makes For Me and My Gal truly swell with sentiment. 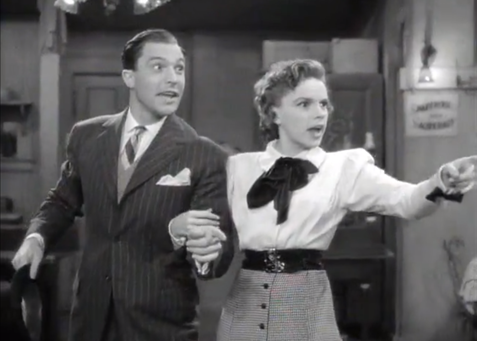 Thankfully Judy Garland and Gene Kelly got together on two more musical efforts to keep it going. Because they help elevate this above the spectrum of a run-of-the-mill propaganda musical with their palpable charisma that transcends any maudlin patches. This entry was posted in 1940s, Musical, Romance and tagged Gene Kelly, Judy Garland, Keenan Wynn, Review, WWI by 4StarFilmFan. Bookmark the permalink. This movie is just so good! Judy and Gene are great together and I liked it a lot more than I thought I would! !